Home » Article » Is Shadow The Best Tomb Raider In Years? Survivor Reborn: Chris’s spoiler-free ‘Shadow of the Tomb Raider’ review. For someone who was quite unimpressed by Reboot and Rise, Shadow has sent me into a complete spin. As part of a series that explores the origins of a modern Lara Croft – in particular, her family ties and relationship with her father – surely I’d hate it, right? This review has no real spoilers, but if you want to skip right to the core of my surprising impressions, you’ll find a TL:DR at the end. Right from the start, the wonderfully crafted start menu drew me in, immediately teasing dense woodland and temple ruins. Start as you mean to go on, as they say, because that kind of location is something that Shadow has truly thrown itself into. Reboot and Rise faced criticism for both mediocre ‘tombs’ (I use the term very lightly) in the first game, and an overabundance of uninteresting, modern industrial locations in the second. Reboot’s dark and rocky settings were replaced with uninviting icy wastelands in Rise. However, Shadow aggressively addresses these problems and draws you into lush green rainforests and environments that truly feel alive. Expect tomb after tomb, temple after temple, all surrounded by paradisian crystal-clear pools of water. I lost count of the number of times I gazed longingly at the screen, wishing I could fall into the game. Beams of hazy sunlight break through the trees, catching mist from cascading waterfalls as they pour into pools of sky-blue water… These scenes of paradise will have you sighing in delight. It’s by far the most aesthetically pleasing Tomb Raider game to date! I’ve felt that any real exploration excitement has been missing in recent years. For example, I found Reboot’s locations mostly oppressive and grim (apart from that mountain-top temple), and I couldn’t have cared less about the metallic, skeletal trash-heap that was the Soviet installation of Rise. But Shadow? Wow. I found myself giddy and eager to explore every single little nook and cranny in this game. Having turned the exploration difficulty to hard, I could no longer immediately see the path forward. This setting encourages the player to look around and try to climb things that aren’t instantly obvious as scalable. Trial and error will become your best friends as you try and navigate correct puzzle solutions or routes along the way. It’s something that classic Tomb Raider fans will enjoy immensely. Speaking of which, remember back in the day when you had to pull switches and levers to progress? Shadow’s tombs bring them back. While there IS infrequent chit-chat between Lara and other characters over her walkie-talkie, the spine-tingling atmosphere that is almost synonymous with classic Tomb Raider has returned in a BIG way. Spectacular sound design flows through the entire game, from immersive ambient rattles and sinister whispers carried by the wind, to absolutely beautiful poignant thematic music. It serves to relax, intrigue, make us cautious, and outright terrify us – there are some horrifying areas in this game that are accompanied by perfect ambient audio that drags you straight into your darkest nightmares with a thundering heart. For what is arguably the darkest chapter in the trilogy, Shadow is also the most vibrant. From Mexico’s enchanting Day of the Dead to the jungle lagoons and the breathtaking tombs themselves, every new sight draws you in with inviting colours and photorealistic design. Here, however, is where my only real complaint comes into play: parts of this game are VERY dark. Like, ‘I-can’t-see-in-front-of-Lara’ dark. Some careful tinkering with brightness settings may be needed to overcome this. It isn’t a major problem (playing with the gamma setting helps), and I hope it speaks volumes that this is the only issue I have with the game. (Yeah yeah, it’s called ‘Shadow’, what did I expect etc.) However, I feel that the addition of a button that lets players manually control Lara’s flashlight would go a long way. Having played the demo at press events this year, I was excited about the return of proper underwater exploration – but let me tell you, I wasn’t excited enough. The underwater sections of Shadow are a horrifying joy to experience. I found myself holding my breath as Lara dived down further and further, hiding in foliage to avoid detection from aquatic terrors. Don’t be surprised if you find yourself getting lost in these claustrophobic, labyrinthine cenotes – just keep an eye out for the corpses of sacrificial victims left as gruesome offerings to ancient gods. Speaking of those grizzly discoveries, you can expect many unexpected endings for Lara throughout this adventure. Cunning traps, sudden pitfalls, blades, spikes, and simple mishaps while jumping will be commonplace (and all the more welcome for the sadists among you.) If you enjoyed those ‘Holy-crap-everything-is-exploding-run-Lara-run’ parts of Reboot and Rise, then treat them as practice for the frantic, even-deadlier gauntlets Lara will have to run in Shadow. Deadly environments are much more prominent compared to the first two entries in this trilogy. In the first ten or so hours, I didn’t see more than about twenty enemies. They’re spread out, in pockets of four or five at a time, and are easily picked off. Thankfully, this game focuses much more on exploration than it does on combat, with the majority of combat happening in the last few hours. So, while Lara doesn’t hesitate to machete her way through enemies with the ease of a hot knife through butter, don’t expect the endless hordes of Reboot or Rise to plague this entry. It’s certainly a welcome return to the trend of the earlier Tomb Raider games! When it comes to tombs and crypts, I can’t praise them enough. Some are small, some are really huge, some are challenging as heck, but all are brilliant. One crypt has Lara descending underground where she finds an underwater tunnel that leads into a chamber with offshoot rooms, and staircases up to an ornate sarcophagus. Not for the first time, it felt like I was back exploring Vilcabamba. Hand on my heart, this has been the first time since the 90’s that I’ve felt I was playing classic old-school Tomb Raider. Right then and there, I was transported back. It’s a spine-tingling experience. It’s important to remember that this is still part of the reboot trilogy and, of course, that means it still delves into the story of Lara’s parents. While Camilla Luddington’s performance has received mixed reviews from fans in the past, many parts of her performance in Shadow’s cutscenes are far better than those of the previous two games. Lara’s friendship with the wonderful Jonah has never been so enjoyable. Their conversations and interactions elicit a range of reactions from Lara – the most welcome being humor, smiling, and laughter. This is a Lara we haven’t seen before in this trilogy and she’s by far the better for it. In addition, you can expect this ‘darker’ storyline to bring out the fiercer, angrier side of Lara that fans of Tomb Raider 4–6 will fondly remember. Facial animations in cutscenes reveal layers of complex emotion in the characters, from pensive reminiscence to feigned happiness and forced smiles. Eidos Montreal has carefully crafted wholesome, believable and deep characters, including a brilliantly multi-faceted villain. Speaking of the range of characters – joy and praise be, the “family drama” storyline has taken a backseat to the pressing matter of the Maya apocalypse. There are touching moments as Lara reminisces of memories from her childhood, which naturally revolve around her parents, but these are done in a very nuanced, relatable way. One unexpected section of the game deals with Lara as a child, and it’s difficult to put into words how charming it is. Her excited, endearing behaviour as she embarks on a ‘makebelieve adventure’ to find various artefacts is not only spot-on how actual children play, but was personally very reminiscent of how I used to play as a youngster as a direct result of playing Tomb Raider. (Hands up, who else used to have adventures in their own gardens because of Lara?) The awesome location of this section, combined with the snippets of relevant storyline and perfectly light-hearted music, make this an absolute joy to play! So all in all, what did I think? Some places can be too dark, and the torch needs a manual switch. 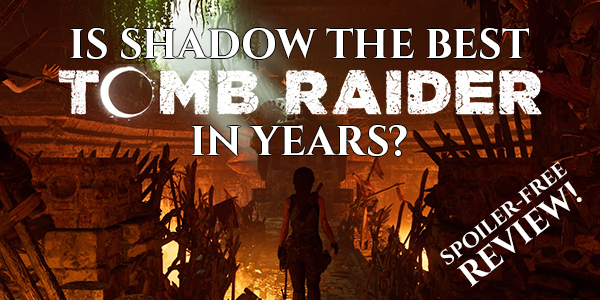 The setting and stunning visuals; difficulty sliders; breathtaking sound design; fun traversal; Lara’s character compared to the previous two games; very infrequent combat; a heavy focus on exploration; constant tomb/temple/jungle settings; spectacular elaborate trap-filled tombs; the story. Speaking as someone who has grown increasingly alienated from the series over the last decade, please don’t take it lightly when I say that I believe Eidos Montreal have absolutely salvaged Tomb Raider and restored it to an immensely high standard. I can’t remember the last time I was so excited about a Tomb Raider game, and it’s been over ten years since I truly loved one of them! I never expected for Shadow to pick-axe its way into my heart, but I’m happily rating it up there with my favourites from the classics. My faith and excitement in the future of the series have been restored in a big way, and I can’t wait to see what comes next! Is Shadow The Best Tomb Raider In Years? by Chris Carpineti / Survivor Reborn is licensed under a Creative Commons Attribution-NonCommercial-NoDerivatives 4.0 International License.